We’re pretty sure we got this shirt from Shirt-a-Day. 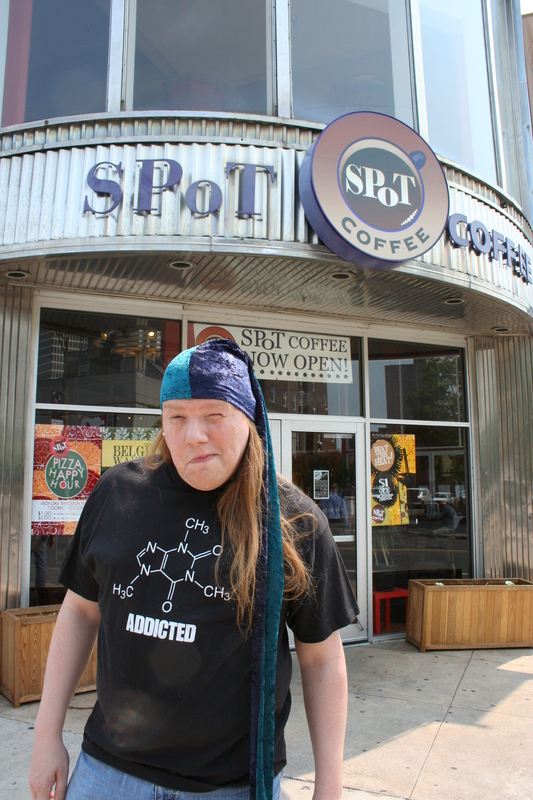 That’s a caffeine particle on the shirt. It looks pretty nifty, doesn’t it? How Stuff Works has a nice article about Caffeine. And, the website energyfiend.com has a bunch of nice articles about the stuff, including a page telling you how many drinks you would need to kill yourself. Keeno! Regarding the hat, Skotte got it at the Kansas City Renaissance fFestival in 1997 1996. Nope. You got the hat in 96, when you, Shanda, and I went to KC Renn Fest. Thank you, I wasn’t sure what year exactly. It was … uhm … ’bout a month ago. Exactly, ’bout a month ago.